If you are going with the same size as your stock tires, this is an easier choice, as all you need to do is look at the tire specifications printed on the sidewall of your tire. If you want to larger than stock however, you may also do this but keep in mind that if you go too big you may need to do some modifications such as a lift or extended fenders. 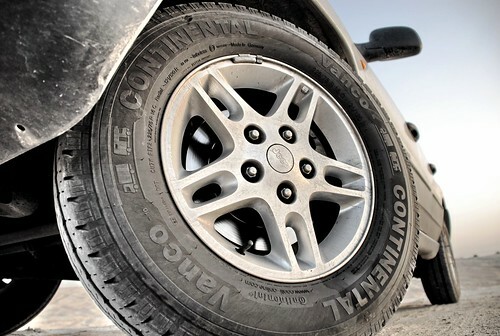 Going with larger or wider tires can help give you more ground clearance and traction. The better the tire is on the street, the worse it will be offroad, and vice-versa. If you’re looking for a killer offroad tire that will get you out of some crazy stuff, consider purchasing two sets of tires, one for off and one for onroad. There are a variety of different treads available and it’s up to you to decide which tread will be best suitable for your situation. For most offroad applications, you’ll want tread that has deep patterns to help act as paddles when freeing your car from mud and rocks. Before putting a new tire on your vehicle, make sure it will fit. If it rubs on the fender walls at all or rubs against anything, chances are it can only hurt you. It’s important to see your 4×4 mechanic to help with any fitment issues and give you advice. Each tire has printed specifications on the side. Make sure to look for the maximum cold inflation and load limit, tread-ware numbers, traction and temperature grades, aspect ratio (ratio of height to width), radial, with of tire and the diameter of the wheel (rim). Knowing your tires’ specifications can be important to help make the right purchasing decision. Like we previously mentioned, if you plan on putting on larger tires than stock, you may need some aftermarket parts and 4×4 accessories to ensure everything works properly, efficiently and safely. Larger tires can require new brakes, transmissions, differentials, suspensions and more. Do your research first and if you have any questions please feel free to visit or call our auto service center. This entry was posted in 4X4, Off Roading and tagged 4x4, offroad, tire selection, tires on August 9, 2013 by Sean Lara.